Let’s flash back to May 5th, 2005. It was game 6 of the Celtics’ first round playoff series against the Indiana Pacers with the C’s trailing 3-2. Up by one in the final seconds, the game was in the bag if Boston could just make their free throws. That was until Paul Pierce decided to retaliate on what he thought was a dirty intentional foul by pushing Jamaal Tinsley to the floor, resulting in a technical as well as an ejection. Pierce then proceeded to take off his jersey and swing it over his head while he walked off the floor shirtless, making a mockery of the situation despite the fact that he may have just cost his team their season. Luckily for Paul, the Celtics were able to pull off a win in overtime and force a game 7 thanks to the efforts of Antoine Walker and the rest of the squad. 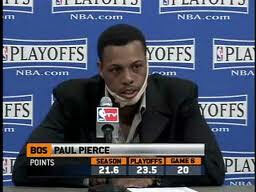 To make things worse for himself, Pierce showed up to his post game press conference with a makeshift bandage wrapped around his face, jokingly stating that Tinsley had busted his jaw on the intentional foul. Why is all of this relevant? Because this is the moment that people really began to question whether or not Paul Pierce’s maturity level and leadership skills were on par with his undeniable talent. At age 27, the same age that Pierce was when the incident against the Pacers took place, Isaiah Thomas had an immature moment of his own after game 5 on Tuesday night. Thomas’ slip up wasn’t nearly of the same magnitude as Pierce’s, but it was a reminder to be patient, as greatness can take years to develop. The reason I’m comparing these two instances is because Paul Pierce is a Celtics legend and Isaiah Thomas has made it clear that he hopes to be the same some day. If that’s going to happen, he needs experience the same learning curves that The Truth experienced on his way to becoming the team player that we all grew to love. After scoring 70 points combined in games 3 and 4 in Boston, IT only managed to put up seven points in what was one of the worst performances of his career. He shot 3 for 12 from the field and only got to the free throw line three times. The injury didn’t appear to be serious and Thomas is expected to be ready to go for game 6 in Atlanta Thursday night. Fortunately the C’s were down 29 so his decision to leave the game didn’t have any effect on the outcome. 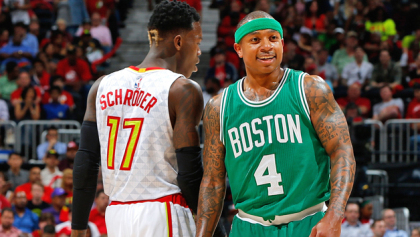 Is Isaiah Thomas correct that his teammates need to step up if the Celtics are going to overcome Atlanta’s new strategy to swarm him? Absolutely. But that’s not the point. Isaiah’s teammates know that they need to step up, so what he’s really doing is stating the obvious and throwing them under the bus when it really isn’t necessary. A nice conversation with them behind closed doors would have sufficed, but there was no reason to make his frustrations public. Going forward Isaiah should focus on taking more blame when he has a poor performance, even if he doesn’t think it was all his fault. That’s what Tom Brady would do as well as anyone else who plays under Bill Belichick. That’s what Kevin Garnett, David Ortiz, or Zdeno Chara would do. And it’s what 2008 NBA Finals MVP Paul Pierce would have done, after he had moved past his immature phase where he often made comments similar to Isaiah’s. As I said in an article a few days ago, Isaiah has all the tools to be a Boston legend. If he can learn to carry full responsibility for his team’s poor performances and deal with the humility of putting losses on his own shoulders, he’ll be one step closer to being in that category. Winning championships helps too, but if he can stick around and continue to grow the way Pierce did, he’ll have an opportunity to fight for banner 18 soon enough.